Boston. Photo (cc) Kevin Tostado. If you give a valuable resource away for free, the inevitable result is overuse and crowding. In the old Soviet Union, groceries sold eggs and butter at near-free prices, and therefore shoppers faced long lines and empty shelves. In modern Massachusetts, on-street parking is available at low or no cost, and therefore drivers can’t find a parking spot. Low parking costs also ensure there are more drivers congesting the roads. Small comfort I suppose that even in Boston, residents are aghast at the idea of reduced parking minimums. It’s not just the city proper. If you look at the other New England cities of 50,000 people or more you see that in general, the closer these sizable cities were to Boston, the faster they grew. (An exception: the similarly fast-growing cities along southern Connecticut’s I-95 and commuter rail corridor, which fall into the orbit of New York City.) 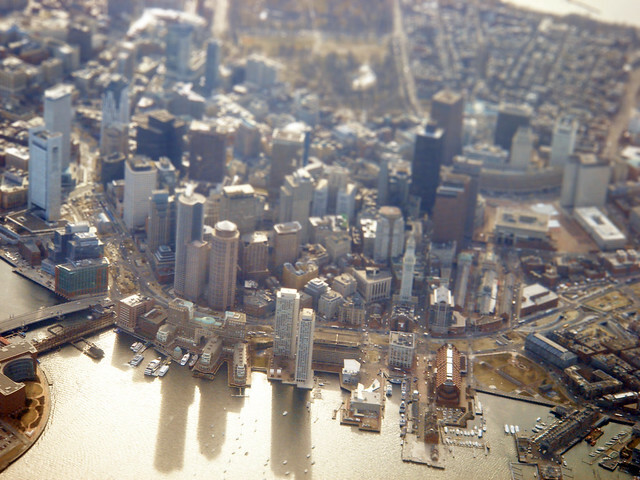 This is an acceleration of a trend that began in 2000-2010, when Boston grew faster than the rest of New England for the first time in more than a century. The Coalition for Transportation Choices is deeply disappointed that House leadership did not follow through on a pledge to address RIPTA’s longstanding and crippling deficit crisis. Last year, Speaker Fox pledged to make “creation of a predictable funding source for RIPTA” one of his top three priorities in this session of the General Assembly. RIPTA has demonstrated fiscal responsibility, has put its administrative house in order, and has embarked on scheduling efficiencies that improve the system. Still the perception that RIPTA is un-deserving hangs over the State House. Employees, employers, tourists, those without private transportation suffer because of this misperception. Slate: Out, Damned Spot – Mandates on parking spaces are strangling America’s cities. But why so much parking smack-dab in the middle of Chicago’s Loop, a walkable area that’s well-served by heavy-rail transit and many buses? The culprit is a regulatory scourge so ubiquitous as to be nearly invisible: regulatory parking mandates that tax the poor to subsidize the rich while damaging the environment and the broader economy. Regulations requiring copious amounts of new parking don’t serve the public interest, but they do bolster the private interests of incumbent car owners who lack off-street parking of their own.